The festive colors of Toa-Toa House can just put you in a happy mood right from the start. 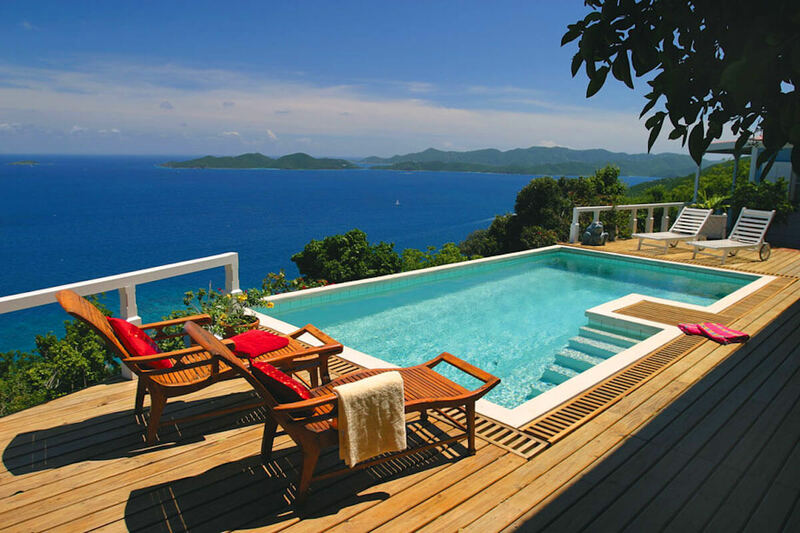 This villa offers lots of relaxation opportunities. You can lounge on one of the teak loungers by the pool, play a few rounds in the billiard room, or stretch out on one of the overstuffed sofas in the Great Room for a short snooze. One recent guest sang its praises by saying, “This villa has a great pool deck area. It is a very private setting, high above the west end. It is well maintained and even has a pool table room.” Have a cool island drink around the pool at the end of the day so you can watch the sun set over the Caribbean. Ocean views with a sunset each evening are yours at this residence situated atop a breezy hill. Built as five pavilions surrounding an infinity pool with sunny deck, Toa-Toa House offers four king bedroom suites with privacy. Right off the deck is the Great Room, with bar, all media, and two sofas for lounging; teak pieces and a variety of accessories gathered from world travels accent this living area. An alfresco dining area in a shady lanai adjoins the country-style kitchen, with the billiard room just next door. The four bedroom/bath suites are on three levels, well placed for privacy, and each offers its own individual mini-fridge, coffeemaker, and a private balcony. Toa-Toa’s master bathroom offers two showers, one inside and one alfresco. Above the Great Room sits one of Toa Toa’s four king master bedroom/bath suites. A four-poster bed and an indoor/outdoor shower complete this air-conditioned bedroom. The third pavilion with a second air-conditioned king suite; is located on the opposite end of the pool deck. The third and fourth king bedroom suites are in two additional pavilions (both above and below suites have air conditioning). These bedrooms are accessible via steps from the spacious pool deck. Toa-Toa House is perfect for reading and relaxing, although you may not be able to take your eyes off the unforgettable views. Toa-Toa House is located near Nanny Cay, water sports, Road Town’s shops and restaurants, and is just a scenic drive away from your choice of North Shore and West End beaches. JoJo the cat lives at Toa-Toa House. Cable TV, DVD player, CD player, VCR, radio, VHS movie + music collections, books, games, A/C in bedrooms, answering machine, DSL line + Wi-Fi for your laptop, wet bar, billiard room, hair dryers, safe for valuables, binoculars, gas grill, assorted snorkel gear, beach chairs, coolers, generator, dishwasher. Optional personal laundry service ($10 per load for the housekeeper to wash, dry + fold). With advance notice, groceries and drinks can be stocked at Toa-Toa House for your arrival, a chef engaged for a special dinner or for several meals, and more maid service arranged for your vacation. Beauty treatments, massages, and spa services may also be arranged at the villa-please inquire. 4-WHEEL-DRIVE RENTAL CAR OR JEEP IS RECOMMENDED FOR TOA-TOA HOUSE RENTALS. A 10-NIGHT MINIMUM RENTAL PERIOD IS REQUIRED AT TOA-TOA HOUSE FOR THE CHRISTMAS/NEW YEAR’S PERIOD.